Jackson, William H. "Red" (1835-1903), Brigadier General, CSA (TN). Participated at Belmont (WIA), Holly Springs, Vicksburg campaign, Atlanta campaign, Hood's 1864 Tennessee campaign. Associated with "Belle Meade" (Nashville) horse farm. Document Signed (DS), Parole of Honor for John Overton, Jr. (Co. I, 55th Tennessee Infantry) at Gainesville, Ala. May 11th, 1865. Signed twice by his Union counterpart, Elias S. Denis, Brigadier General, USA. 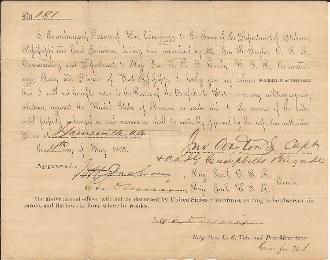 I, the undersigned Prisoner of War, belonging to the Army of the Department of Alabama, Mississippi and East Louisiana, having been surrendered by Lt. Gen. R. Taylor, C.S.A. Commanding said Department, to Maj. Gen. E. R. S. Canby. U.S.A. Commanding Army and Division of West Mississippi, do hereby give my solemn Parole of Honor..."
Included with the parole is another DS, United States of America, District of West Tennesee, Overton's Amnesty Oath taken June 20th, 1865. Both documents are very fine. Rare parole and the first such type we have had.